In the summer we always have tasty frozen treats in our freezer. This summer is no different and I had the opportunity to try out some great new ice cream and yogurts from Unilever! Popsicle brand has a new line of popsicles available this year called Yosicle, it’s a popsicle and yogurt treat all in one! We tried the Yosicle Torpedo! It has three yummy flavors of frozen yogurt – purple berry, watermelon and vanilla. Pinky and I have really been enjoying these especially on the really hot days, which is pretty much every day this summer! I love that not only is it a treat but it helps her get her daily dairy intake as well, each variety has 10% nonfat yogurt. Check out the other Yosicle flavors – Yosicle Layerz! and Yosicle Duos! Prior to this I had never tried the Magnum ice cream bars, they always looked delicious but I never bought them because I’m usually buying the fun kiddie ice cream and popsicles for my daughter. So, this was a rare treat. We tried the Magnum Mini Classic ice cream bars, which are a smaller version of the Magnum Classic Ice Cream bars. One word – delicious! They are the perfect little ice cream treat that let me have a little indulgence without going overboard. The chocolate is very rich and the vanilla ice cream is so yummy and creamy. I’ll definitely be getting more of these for a little nighttime snack treat when Pinky’s in bed 🙂 I’m also going to have to try the MAGNUM Mint and MAGNUM Dark varieties, yum yum! Daddy Digger doesn’t really like a lot of candy, but, there is one favorite chocolate candy he can’t resist and that’s Reese’s Peanut Butter Cups. So, when I saw the new Breyers Blasts! Reese’s Chocolate I knew we had to give it a try. I don’t think you can really go wrong when you put chocolate and peanut butter together! Breyers Blasts! 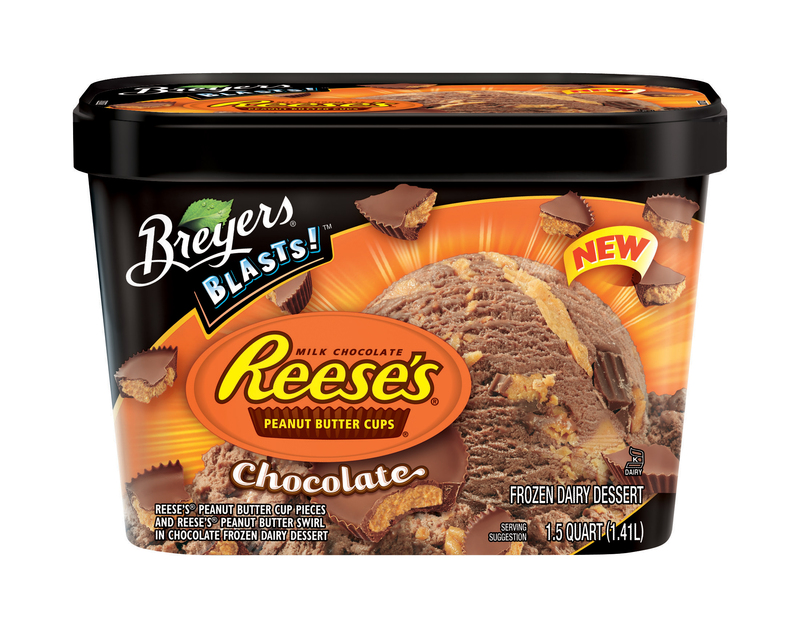 Chocolate Reese’s is chocolate ice cream with Reese’s Peanut Butter cups and Peanut butter swirl. It’s so good but we can only eat a little bit at a time because it’s so rich! There are lots of other Breyers Blasts! flavors available: Golden OREO Cookies & Cream, OREO Birthday Blast!, Klondike Krunch, Banana Split and Smore’s. I think the Banana Split flavor is next on the list to try. Next up, we tried the Klondike Chocolate ChocoTaco! I remember ChocoTaco’s from the ice cream truck when I was a kid and it brought back great memories 🙂 Filled with light chocolate ice cream with a sugar taco. It is coated with dark chocolate and topped with crispy rice and it’s sooo good! I love that I can now get these at my grocery store! We really enjoyed all the new ice cream and frozen treats from Unilever. I would definitly recommend hitting your grocers freezer and trying them out for yourself this summer. Popsicle, MAGNUM, Breyers Blasts!, Klondike and Good Humor products are available at your grocer’s freezer. One lucky Mommy Digger reader will win FREE full value coupons for Ice Cream treats from Unilever! I’m excited to try the york peppermint patty bars! I would love to try the Breyer’s Blasts! I’m excited to try the Magnum bars, they look delicious. Choco Taco sounds delicious and I would love to try it! 🙂 Thank you. I really want to try the York ice cream!! I would like to try the choco tacos. I am excited to try Choco Taco’s.